This article focuses on the ways in which outsourcing impacts virtual teams. It considers some of the managerial, business and social issues that are associated with moving from an internalized delivery model, to one where at least some part of a business is outsourced. To provide some context to this article it is important to define how outsourcing is being used here. In this article we consider outsourcing to be the process by which a business function or task such as engineering, HR, payroll, manufacturing, shipping etc. are undertaken by an organisation other than the principal. For instance, a company that traditionally has undertaken its own R&D, engineering and manufacture may choose, for business reasons, to send some or all of its engineering to a different location to be undertaken by a different company. Access to specialist skills not readily available at the home of the business. There are, of course, hybrid reasons why businesses will outsource work, but typically these three cover the vast majority of causes. The impact of outsourcing is a very complex one. At its simplest level, outsourcing can be seen as shipping jobs to another location and, this is sometimes the case. However, properly managed and structured, outsourcing can result in the business and its home office being able to expand through being able to undertake additional projects with its in house staff while at the same time providing work in other locations. Outsourcing of some parts of a business can mean that the business, which may not have been viable with a sole location delivery model, is suddenly revitalised and is able to maintain some local employment, local employment that may otherwise have disappeared. It may also be able to give more stable or more varied work to its staff and avoid being too exposed to local variations. Outsourcing of some tasks can also mean the difference between a project going ahead and that same project not happening. The outcome of some of these same projects can then lead to long term broader employment in a region, employment that is generally welcomed by the community as a whole. As such, from a business perspective, outsourcing can add value to the business, its shareholders and, where managed well, the broader community. It can also bring employment to developing nations, given that this is often where outsourced manufacturing is sent. Done badly, outsourcing can lead to a severe social impact on the home office location where the work is moved from. Badly managed or ill-conceived outsourcing can also, on occasion, result in exploitation of the workers to which the work is outsourced, something which is reported in the media from time to time. 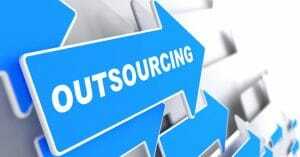 As such, the business impact of outsourcing needs to be carefully balanced. Businesses need to deliver a fair and reasonable profit to their shareholders but, also must maintain their social license to operate. Allowing the pendulum to swing too far in either direction is not good for the long term sustainability of the business, nor the social environment in which these businesses operate. The social impact of outsourcing needs to be judged from a number of different perspectives. For the personnel at the location the work is moved from, outsourcing will be seen it as a bad thing, at least during the period of adjustment when their jobs are transferred overseas and they must seek work in outer businesses or industries. For those receiving the outsourced work it will be generally be seen as a good thing, bringing new opportunities and challenges to their workforce. For the business, if done correctly, outsourcing can be a generally positive thing, either accessing rare skills, accessing a suitable volume of workers or reducing labour or manufacturing costs. But, again, the business needs to ensure it maintains a high level of vigilance on how the outsourced work is performed, particularly if the work is knowledge based where local knowledge and skills can play a major part in the successful outcome of work. Vital to the success of any outsourcing effort is a strong and viable virtual team relationship between the host office or organisation and the outsource location, whether that be part of the same business or not. Spending the time to set up this virtual team and investing in its development and ongoing viability can make the difference between a successful and unsuccessful outsourcing. Some organisations will go as far as to embed the philosophy of sharing and outsourcing work within their global business as key to their long term success. These companies establish reward structures within the various locations, recognising the commitment to successful sharing of work and encourage offices to look internally for capacity when needed. Other businesses treat outsourcing and sharing of work as a contractual thing, with each office attempting to make its own required margin off its partner office, this approach drives up business costs and is usually only successful when the client is prepared to pay the premium needed. One of the biggest hurdles most businesses encounter when starting to outsource work however is with the existing workforce. Change such as this is quite confronting for most people and as such, existing workers tend to feel defensive, that their jobs may be on the line. It is therefore incumbent on the business to be honest with these workers, explain the reasons for the change to past practice and what the impact will be on their own positions. For some workers this may mean the loss of their position, but for others it may mean greater stability and a more diverse and interesting future workload. Either way the organisation needs to be honest.